Although it may not be evident from the screenshot above I have upgraded to an iPhone X. In a smaller device I have more screen space – well, the top and bottom of the screen isn’t used that well so my iPhone 7 Plus probably showed more. On the X the top is interrupted by the notch and the bottom is mostly used for the home indicator / app switcher. I do like the gestures though. Using an SE with a physical button really grates now. Also the OLED screen is very good. I like using apps with a dark theme just to appreciate it more. For a few years now I have been using THREE as my mobile network provider. I switched over because of the ‘Feels Like Home’ feature they offered and the fact that I could get high levels of DATA use included in my tariff. I have used this service in a few countries now and my only beef is the availability of 4G. I seem to get 3G at best and for some uses it just does not cut it. Having said that its great to use my iPhone as a SAT NAV when driving abroad. Recently, in Europe, roaming mobile phone charges have been scrapped and users can use their ‘home’ contract at no extra charge (fair use policy applies). This means all other providers now offer effectively a ‘feels like home’ service. Not sure what the post-BREXIT tariffs will be like though. Its been a while since I last posted an update here. I guess I should start by saying that my iPhone got replaced with a model 7 plus in silver. I also got a second generation Apple Watch. I am deeply into the Apple ecosystem now. So much so that I tried to use an Android phone (Nexus 5) for a few months and found it a real bind. I am happy with the iPhone 7 plus as I get one to two days of use from a charge. I get the same from my Apple Watch as well. I do wonder, however, how long I will be able to keep replacing these items as the cost seems to be increasing yearly. At 142 days and counting I am still finding things to love about my favorite iPhone accessory. 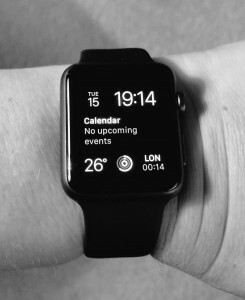 From discreet notifications, activity tracking, through to Siri commands and more. The Apple Watch does not disappoint. 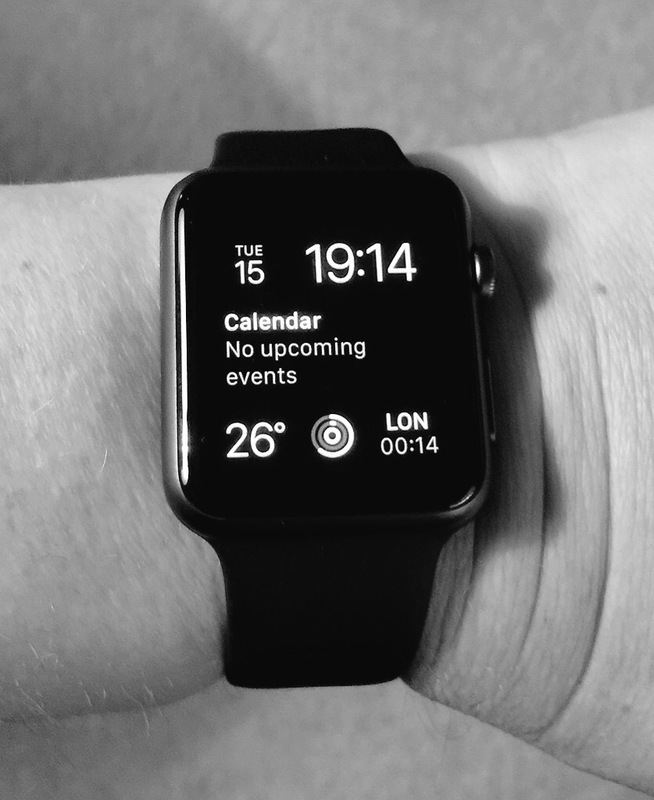 I went for the 42mm Space Grey aluminium sport edition which ships with a black strap. White and Fog straps also work well with this case colour. However the straps’ securing pin (clasp) for these is stainless steel and not the black stainless steel of the original. The watch seems very durable. Apart from securing marks on the strap none have appeared on the case. Unlike other brands where a Titanium watch has many scratches after a few days. Multiple straps and an Apple Watch charging station mean I have spent nearly half the original cost again on accessories. It will be interesting to see how Apple develops this catagory. Perhaps straps will have transferable clasp pins in future so they match the case colour. When the iPhone 6 Plus was announced I took a trip to my local Apple Store for a look. I put my iPhone 5s next to one and marveled at the difference. I picked up the 6+, rotated it, used it one handed and decided that it was too big. Then, some weeks later, I got to try one again and this time I was smitten. Now I have a white (and silver) 6+ with a white silicone case and the 5s is long gone. Last weekend I found the screen protectors from the 5s and could not believe how small they were. To think the 4s was even smaller. 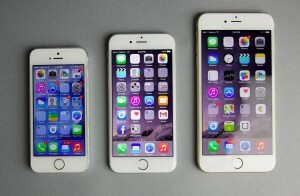 For some reason, when it comes to screens, bigger soon becomes the norm. From TV screens through to iPhone screens the rule holds true. Well, now that GiffGaff is a recognised provider I have noticed a couple of changes. Firstly the GiffGaff name appears in the carrier area of the screen (top left). Secondly the ‘hotspot’ feature now works. This is a great addition. If only GiffGaff ran on the EE or Three networks (instead of O2) – I would be able to use the 4G service. My only option seems to be to upgrade to a 5S or 5C. Beautiful design, hundreds of new features, and now installed. I needn’t have worried about any watering down of the changes. It was just refinement. For anyone with an interest in design iOS 7 will be greatly appreciated. Whenever I upgrade the operating system on my phone I like to do it as if it were new. This means resetting my phone beforehand. As I get ready for iOS 7 on the 18 September I have made a note of the apps running. 73 in total. This could be a good opportunity for a clear out. For a long time now I have used Giffgaff as my mobile phone network provider. They offer good value and run on the O2 network in the UK. The only problem I have is that Apple does not recognise them and I have to manually enter MMS and data settings. Also I cannot take advantage of the personal hotspot feature as this is set to O2 and cannot be changed. I hope iOS 7 addresses these issues. In the automotive industry there are regular annual events where manufacturers display their latest cars. At these events there are often so called ‘concept cars’ which show what a future car might look like. The designer’s imagination is allowed to come to the fore and potential innovations are displayed. Some concept cars are never meant for production; others are. These concept cars make us drool; these are the cars we want. This is great publicity for the manufacturer. Many months’ later production vehicles are released to the market and only a fraction of the concept car is evident. We, the public, are a little disappointed. The development of iOS 7 appears to be following a similar path. Effectively the ‘concept’ was released in the summer and this was a radical departure from the current iOS 6. Then over various beta releases the elements are changed and the design moves back towards a less radical one. Lots of publicity and excitement followed by a release that falls below expectation. I have not experienced iOS 7 yet and hope that the final release matches (and exceeds) the original concept.